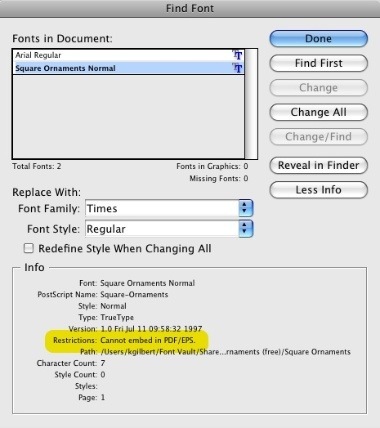 Some TrueType and OpenType fonts cannot be embedded in a PDF or EPS file, due to restrictions dictated by the font designer. Though such fonts are few and far between, you may encounter this sometime. 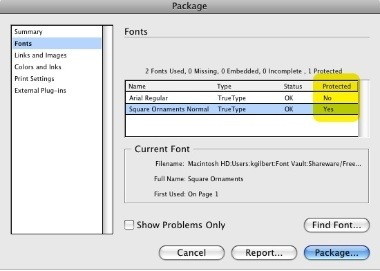 If you use one of these fonts, and try to create a PDF via InDesign's File > Export, you will see the dialog below. If you want to check if a font you're using has font embedding restrictions in place, choose Type > Find Font, select the font in question, and click the More Info button. If anything other than "Normal" is displayed next to "Restrictions", then be careful when using the font. 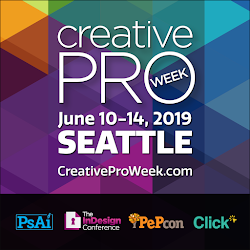 You can also choose File > Package (CS4) or File > Preflight (CS3), choose Fonts in the Package dialog box, and see if any of the fonts you are using display a Yes in the Protected column. Warning: this method is less reliable in CS3 than in CS4. The Type > Find Font method seems to display accurate results in both CS3 and CS4. Keith, thanks for this great tip. I just installed InDesign today, although I've had Creative Suite CS for about four years now. The program always intimidated me so I never bothered to use it, let alone install it. But I needed to design my resume to start job hunting so I had no choice. I love the grid system as it enabled me to easily add type elements and properly align them. I'll have to splurge and get the InDesign CS Bible one of these days.